Hand crafted by Navajo silversmith Yvonne Shirley, but is not signed. Yvonne worked for the Browns for many years and crafted many wonderful jewelry pieces for us. 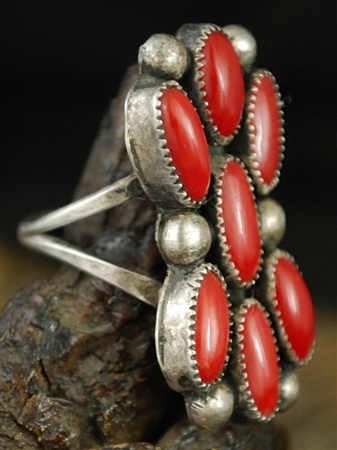 This lovely sterling silver cluster ring is set with 7 matching cabochons of natural Ox blood/red Mediterranean coral. The center stone measures 3/16" wide x 3/8" long. Each stone is set in a hand crafted saw tooth bezel and accented with silver drops set on a split shank. 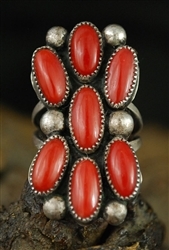 The actual top ring cluster measurements (silver & stones) are 1 1/4" long x 11/16" wide. The ring size is 8, can be resized.